It is so hard to like a movie that features a character like Neil Armstrong. He’s not the stereotype of the other Gemini astronauts. He wasn’t a cowboy. He was quite the opposite. So it makes his character in FIRST MAN difficult to root for. FIRST MAN tracks Armstrong’s life from right before he was selected for the Gemini program until he lands on the moon. That’s a space of 8 years. He saw lots of death that obviously shaped his personality. No loss was more deeply felt or more important to this story that the death of his young daughter, Karen. A seemingly introspective, emotionally controlled man seemed to turn further inward. Armstrong was a brilliant test pilot, cool under the most dangerous or difficult of circumstances. That made him very good at his job. It also made him a very difficult co-worker and a very tough man to like. He seemed to be a loving husband and caring father. But his job always seemed to be his number one priority. That quiet introspection and lack of emotion had to make this movie an immense challenge for Damien Chazelle and Ryan Gosling. How to make this seemingly unlikeable man a hero? They did it by focusing on how he overcame tragedy after tragedy during this period of his life. The death of his daughter, the Apollo testing accident that claimed the lives of Gus Grissom, Ed White and Roger Chaffee, and the crash of a training jet that killed Elliot See and Charles Bassett. That is a lot of death to deal with. Maybe his training as a Naval aviator helped. But it seemed to be his sheer force of will more than anything else. That is what makes FIRST MAN so interesting. Gosling does a lot of acting with his face and body, mostly because Armstrong wasn’t a talker. At one point after after Armstrong leaves See and Bassett’s memorial, White goes to see him to talk and Armstrong says bluntly, he didn’t leave the memorial because he wanted to talk. He shuts down White. Just like he shuts down everyone when he is not comfortable talking about feelings. But Gosling shows us how he is feeling. How he is focused. How he has his own way of dealing with all this. Chazelle makes some interesting choices in how he portrays certain events. If you are expecting big special effects like those in APOLLO 13, you will be disappointed. In fact during the Gemini 8 launch, we never see the outside of the capsule. It all is very claustrophobic as we watch Armstrong and David Scott get slammed around in less than heroic fashion. But again, this is not a movie about the big picture of NASA’s manned missions. It is about one man struggling with grief while trying to make history. The one time you get a sense of awe and wonder is when Armstrong and Buzz Aldrin (the remarkable Corey Stoll) approach and land on the Moon. That is when Chazelle allows the spectacle to breathe. Josh Singer (THE POST, SPOTLIGHT) took James R. Hansen’s book and make a compelling screenplay, while trying to keep the Armstrong family satisfied and in the loop. And, Claire Foy does great work as Janet Armstrong, the wife who seems to mirror her husbands stoic facade. 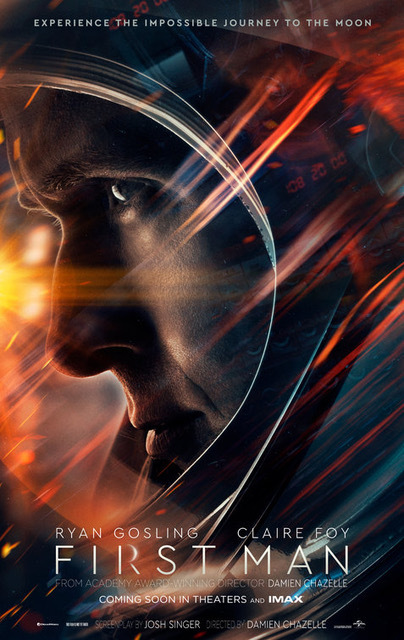 FIRST MAN would be the kind of movie Oscar voters loved if it was more like APOLLO 13 or THE RIGHT STUFF. Instead it is a gripping drama about a man, his demons and one historic step.